Risotto in Bite Sized Portions! What could be better? Risotto is such a wonderful treat. Creamy, yummy, satisfying along with a little guilt. This recipe helps to share that guilt as the risotto is formed into two bite balls to make a wonderful appetizer without the need for bowls or spoons. You can make these in advance, refrigerate for up to two days or freeze up to 6 months. This makes it great to make ahead for a party, a little time-consuming but not hard to make. If making ahead, the only thing you need to do before serving – pop them in the oven until warmed through – about 350 degrees for about 15 minutes. If making the day of – do all the steps but hold off on the frying until just ready to serve. They are best served HOT. You can also change it up by being creative with the filling. I will have more filling suggestions at the end of this post. Heat the stock in a sauce pan over med to med-low heat. Try to keep it under a simmer – you do not want the liquid to evaporate, just be warm enough to keep the heat level in the rice pan. Saute the onion in the oil until the onion is slightly translucent. Select a large saute pan with high sides (about 2 inches) or a large stock pot. The wider the pan, the faster it will cook as more of the rice is exposed to the heat. Stir in the freshly ground black pepper (you can use white pepper if you don’t want the black flecks). Add the rice and sauté over med heat until rice is almost translucent. You can let it rest for 20 seconds or so in between stirring, but be sure to stir so you do not burn/brown the rice. Stir in the white wine, stir continuously until all the liquid is absorbed. Add 1 cup of stock, stir until fully absorbed, then continue adding 1 cup at a time and stirring until rice is cooked to a toothy texture (you may not need all the stock or may need a little more). The whole process should take about 20 – 30 minutes depending on how deep your rice is. When it is done – set it aside until cool to the touch. ** Toothy: Hmmm – hard to describe. But when you bite into the grain, you would still see a little of the white in the middle – the outside of the rice grain is soft with a slightly harder inner core. If you are not sure – cook it until you feel it is done to your liking. Heat olive oil over med-high heat. Add the mushrooms, pinch of salt, fresh ground pepper and sauté, stirring occasionally until caramelized. Put the eggs in a bowl, the flour on a plate or in a flat container, and the breadcrumbs in a separate plate or flat container. Take 2 TBS of risotto and form into a ball (this will get messy). 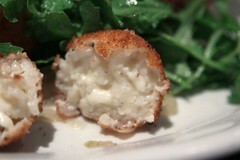 Press a small amount of the mozzarella and mushroom mixture into center and close around the mixture to form ball. Roll the ball in the flour, shake off excess. Roll in the egg, shake off excess, then roll into breadcrumbs. Place on a baking sheet until you are ready to fry them. To fry, place a few balls into the fryer at a time. Be sure to turn them so all sides reach a golden brown. If using the stove top pan – place the balls into the pan (do not over crowd) and turn once the bottom half reaches a golden brown. Drain on paper towels or a rack. Serve or cool down before refrigerating or freezing. sautéed vegetables diced very small: Asparagus, Broccoli, Zucchini, Eggplant, Summer Squash, Peas, etc..
Roasted Tomatoes: Slice a plum tomato into 3rd, drizzle with olive oil, sprinkle with salt, pepper and oregano – bake at 325/350 until shriveled about 30+ minutes; remove cool and mince. Herbed Cheese: Goat cheese mixed with fresh herbs, Feta cheese mixed with fresh herbs, Boursin, flavored cream cheese, Blue Cheese, etc..
You can use anything you like. Pate, meats, veggies, cheeses, tofu, etc.. whatever. Just have fun with it. Your guests (and your belly) will thank you! Posted by culinaryease on January 15, 2011 in Cooking for two or less, General Cooking, Parties, Appetizers, and More, Recipes, Vegan/Vegetarian and tagged Appetizer, Blue cheese, Mushrooms, Risotto.